Once again we did the round trip from Santa Cruz to Monterey, California, on our tandem. The round trip was nearly 109 miles this time with the extra 2 bonus miles from missing a turn. It was an ACTC club ride with about 35 riders showing up. The ride leader, and one of the photographers, was Lane Parker. We started at 8 am from Natural Bridges Drive in Santa Cruz and were surprised by the large turn out considering this was going to be well over 100 miles with climbing. We all started as a group. Being the only tandem this time, we went out to the lead. It was a bit cool at the start and the temperatures stayed in the 60s most all day, while back in San Jose the temperatures climbed into the 90’s. We did not go on highway 1, but took several back roads. There were no long sustained climbs on this route but a lot of up and down, that ended up with 4,300 feet of climbing by the end of the ride. We rode with much of the group, making one stop along the way for a regroup. Once we reached Fisherman’s Warf in Monterey, we locked up the tandem and walked out on the pier to enjoy a bread bowl of clam chowder. After biking that far, it really tasted great. 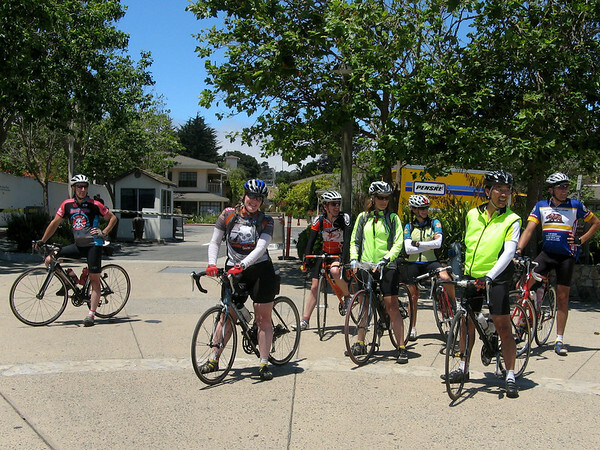 After lunch we gathered together to start the ride back, taking the bike path from Monterey. When we took this picture, which included Steven (on the right in front in the yellow vest) we did not realize how much he would help us on the return due to some unusual occurrences. Just a few miles on the bike path, which crosses several side streets, Franz came up too far to the right and hit too much of the curb, rather than the inclined section where you are suppose to ride to get back on the bike path from one of the side streets. It was kind of a hard hit and our camera, which was in a bento box on our tandem, flew out and landed on the ground. We stopped and retrieved that and realized our rear tire had flatted. No problem, since we had two spare tubes. Most of the riders in our group went on since we told them we had everything we needed and were fine. Steven decided to stay with us. The rear tire on a tandem is a hassle to remove since it has a drag brake on it. But in short order Franz had replaced the tube and was pumping up the tire. Once we got to over 90 psi and removed the pump, a loud sound of air was heard as the tire went flat. The valve on the stem had broken and was stuck in the pump. Okay, one tube down so Franz removed that tube and put in our second spare tube. Our pump had the valve still stuck in it, so Steven was kind of enough to give us a CO2 cartridge which we used to inflate the tire. Finally we were on our way and told Steven to draft behind us as we caught up with the other riders. We wanted to make sure he was always behind us since he had stopped to help and would not want him off the back by himself. We learned that this was his first ride over 100 miles (a century) but he was plenty fast enough. We finally caught up with some of the other riders then stopped at the regroup spot, but only about one third of the riders had regrouped and the rest had gone on head. We didn’t think we needed to eat anything so we decided to go ahead, and Steven decided to join us again. It was getting a lot warmer, but still only in the 70’s. As we finally arrived within 10 miles of the finish we were getting a bit tired, so pulled into a gas station/market for a short stop. Franz bought a diet coke in a cup with ice, which Anne also really enjoyed. Soon we were off again and within a couple of miles, BOOM! A loud noise meant only one thing, a blow out. We quickly stopped the tandem to find out the rear tire was yet again flat. After Franz removed the tire from the wheel (while Anne was holding the tandem), we could see the tire had a huge cut across it, something we had never seen before. This is the type of tire failure you can not boot. Fortunately, we were carrying a spare tire strapped to the frame of our tandem. It was a lesson we had learned from some other tandem riders but had never needed before. When we removed the tube from the tire, it was completely shreaded. We thought about patching the tube that had the pinch flat before but it had two “snake bite” punctures which are hard to patch since they are separated. Steven offered one of his spare tubes, and although it was not rated for 700×28, we decided it would get us back to the start. After putting in that tube, pumping up the tire again, and putting the wheel back on the tandem, we were off once again. The route sheet was a bit puzzling after we made the first left turn on Front Street. We found ourselves in some busy Santa Cruz traffic. We eventually made our way to Cliff Drive, the road along the ocean we had taken at the start of the ride, so we took that back to the van. We had a great ride but were very happy to get back to the van before any tire went flat again. It was maybe the longest ride Anne had ever done (due to the bonus extra 2 miles). But having help from Steven made an otherwise problem plagued ride a lot easier to get through.